300Mhz processor or higher; 256MB RAM; 100MB free hard disk space; Windows XP; Windows Vista; Windows 7. 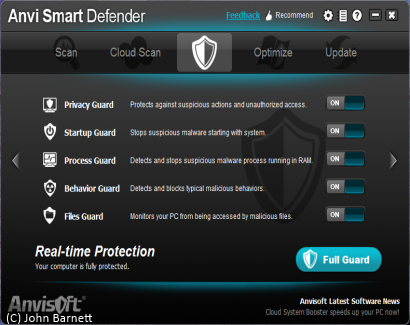 Anvi Smart Defender is a full featured, dual purpose, anti malware and PC optimization application capable of both cleaning your system of Trojans, worms, spyware, bots and other malicious threats and also optimizing your system. The applications graphical interface contains 5 basic tabs enabling the user to perform the following operations: Malware scan; Cloud Scan; Guard; Optimize; and Update. Each tabbed option has its own set of on demand buttons; it is only the Guard tab that contains setting options which can be changed to suit the user. 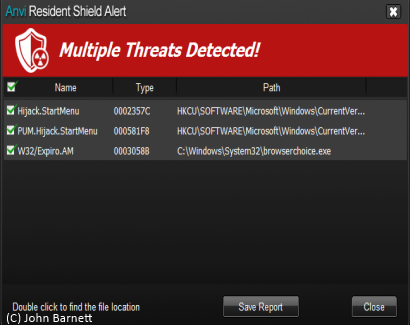 For example on the anti malware tab you have the option to perform a quick scan, full scan, or a custom scan, with the custom scan allowing you to choose which locations to include in the scan. Our tests showed that Anvi Smart Defender was comparable with other well known anti malware applications. However we were disappointed that Anvi Smart Defender's swordfish anti malware engine did have a tendency to produce numerous false positives. The cloud scan allows the user to directly drop files onto the cloud scan window for analysing. This, unfortunately, didn't happen in our test as we found it impossible to simply drag and drop any file to the cloud scan window interface. No matter what we tried it simply defied all our efforts. Our only option was to use the Add File option instead. This finally producing the required result. The guard section provides real time protection against suspicious actions and unauthorised access. Within the interface window there are five section, Privacy, Start Up, Process, Behaviour and Files. From within this interface the user has the option to turn on or off the relevant options. 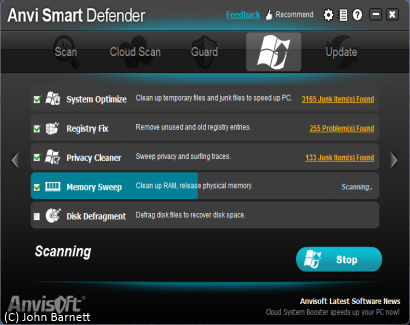 Anvi Smart Defender optimizer is rather lightweight, primarily removing temporary internet files, privacy and surfing traces, fixing registry problems, cleaning up RAM thus releasing physical memory for further use and defragmenting the hard drive. The disk defragmenter, incidentally, is not enabled by default. To enable it you simply have to place a check mark (tick) in the box to the left of the disk defragmenter option. By clicking the on demand Care Now button, optimization will begin. After completion the sections marked, System optimize, registry Fix and Privacy Cleaner, display the total number of files cleaned. If you click on this total number of files cleaned information you are presented with a list of files the application is about to remove. If you wish to keep a specific file you should remove the check mark (tick) from the left side of its entry. Checking which registry files are about to be removed is of particularly importance and should be done as a matter of course when each scan is completed. Being cautious eliminates the possibility of a file or set of files being removed that maybe essential to the working of your PC. Better to be safe than sorry! There is actually some controversy over registry cleaners as to whether they are good for your PC or not. Our own opinion is that, if you are not comfortable manually editing the registry yourself, then we suggest that you leave well alone. While some registry cleaners are lightweight, this includes Anvi Smart Defender, others can be rather aggressive and remove files that shouldn't be removed. 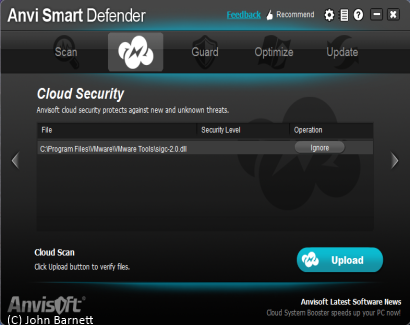 Anvi Smart Defender is a full featured, easy to use, application that quickly deals with all sorts of malware threats. It also has the option of optimizing your system so that it runs faster. 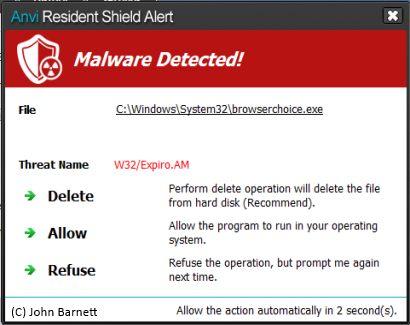 While we found the application easy to use, we were somewhat surprised that the anti malware engine produced numerous false positives, especially since other anti malware applications, such as Windows Defender and Malwarebytes Anti Malware didn't even flag any problems. The optimization is fairly lightweight and basic to say the least, mainly clearing out such things as temporary internet files, invalid registry entries , etc. One disappointment was that Anvi Smart defender doesn't clear the index.dat files which have a nasty habit of storing all the information you really want to get rid of. Other optimization applications, such as Piriform's CCleaner do this by default. 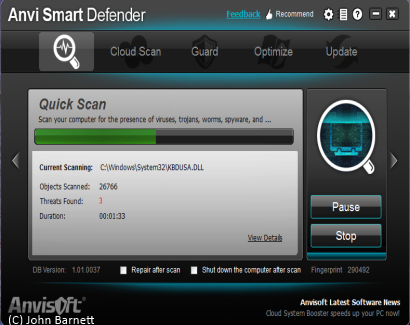 As a totally free application, Anvi Smart Defender is certainly well worth having, it is just a pity that it throws up so many false positives when scanning for anti malware.